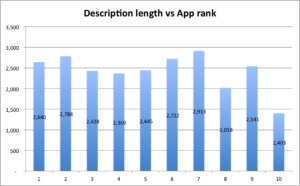 Our in-depth ASO keyword ranking study of 70 apps (the top 10 returning for seven keywords for the health and fitness category) yielded some fascinating, surprising and actionable results very useful for app store optimization keyword ranking strategies. For keywords with higher search popularities, we assumed that the top spots would be captured by apps earning high category ranks (i.e. driving many downloads from many sources, of which that one keyword was a small factor). This was proven somewhat true. In order to obtain a top 10 rank, apps would require the keyword to be present in the title. This was true, yet not as staunchly as we had anticipated. For the more popular keywords, apps would include that keyword in the description opening and the screenshot captions, in order to be recognized and by searchers. While many apps did both, there was no benefit for listing keywords in the description opening, yet there was a benefit for listing keywords in the screenshot captions. 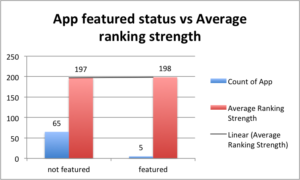 Apps with more ratings and a higher star count would earn higher rankings on more popular keywords. 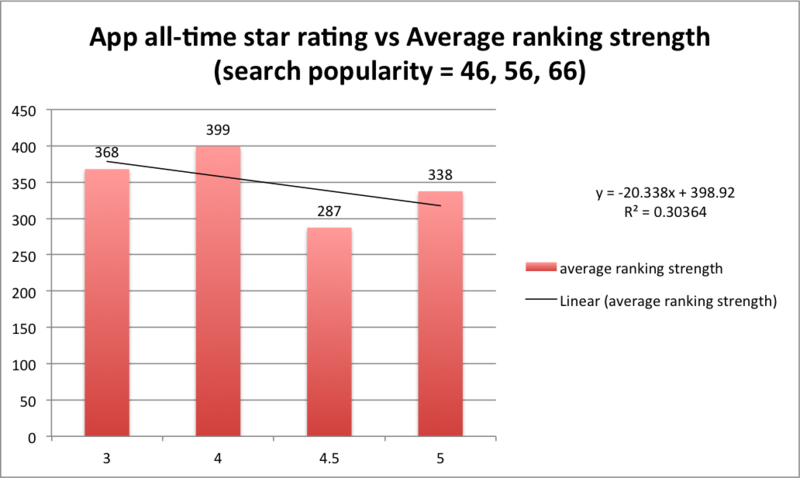 While the total number of ratings correlated somewhat with better rankings on popular keywords, high star ratings showed a negative correlation for earning appealing ranks for more popular keywords. For the most part, the longer the app's description was, the higher that app's ranking strength. This contrasts with what we found when studying the descriptions of the top 100 apps, where shorter descriptions correlated with better rankings (likely because the top 100 apps don't need to explain their apps as much). Listing an app's social proof in the description opening was the most effective use of the first five description lines. For keywords high in search popularity, apps did not benefit by mentioning a keyword in the first five description lines. 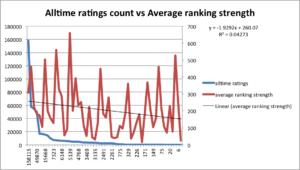 The total number of ratings was somewhat correlated with an ability to rank better; moreover the number of current ratings of an app was 6.9x as important as the number of all-time ratings. 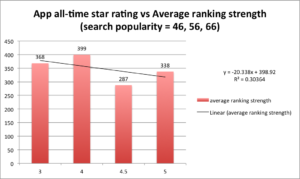 Apps returning for keywords with a lower search popularity and a high star rating tended to rank higher; yet, for apps with a high star rating ranking on high search popularity keywords, the reverse was true, where higher rated apps ranked worse. It's possible that this is a manifestation of users distrusting apps rated higher, possibly assuming that their reviews are less-than-genuine. It's also possible that apps with lower star ratings are attaining top keyword ranks inorganically, through keyword burst campaigns or Apple search ads. Using an exact title match for the search keyword produced better rankings. Apps with shorter titles did not out-rank apps with longer titles. Apps with splash-style screenshots outperformed in the health and fitness niche, followed by apps with videos. 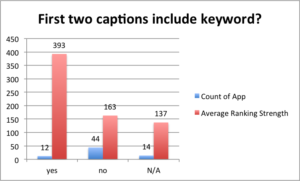 Mentioning the search keyword in the first two screenshot captions led to an average 2.4x improvement in ranking ability than apps which neglected to do so. 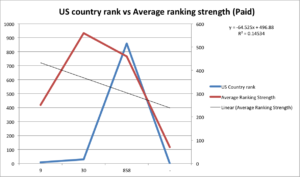 App category and country rank were both decently correlated with their abilities to earn top ranks; though category was more-so correlated with keyword rank than country. Paid apps earned better ranks than their free competitors. 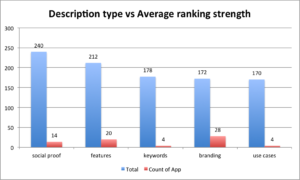 Developers with 8-27 apps in their developer account outperformed in attaining better keyword ranks. The general relevance of apps returning for a keyword search deteriorated below search popularity 30, with apps less overtly relevant to the keyword earning top 10 spots with ease. There was a 100% search ad placement for the seven keywords. Was the keyword included in the description opening? Was the app featured by Apple? Was the icon related to the keyword? Did the first two screenshot captions include the keyword? Additionally, we created a data point that allowed us to effectively analyze ranking (our KPI) for each dimension across all search popularity levels. 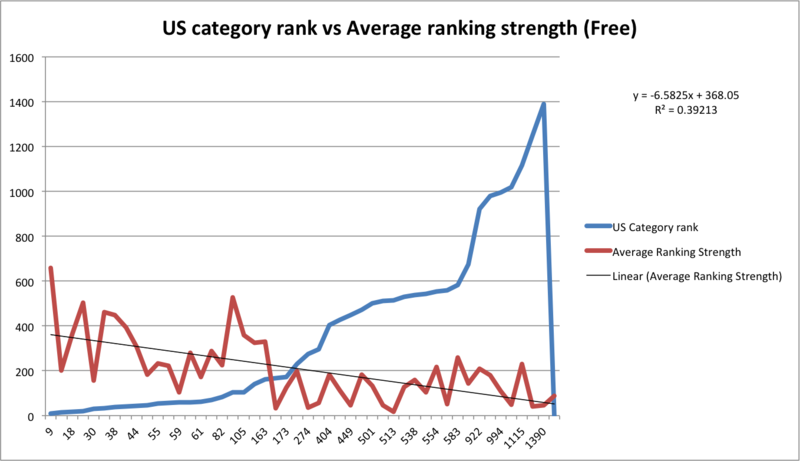 We called this data point "Ranking strength," and calculated it as the reverse ranking of the app for a keyword (i.e. a rank of 1 = 10) * the keyword's search popularity. 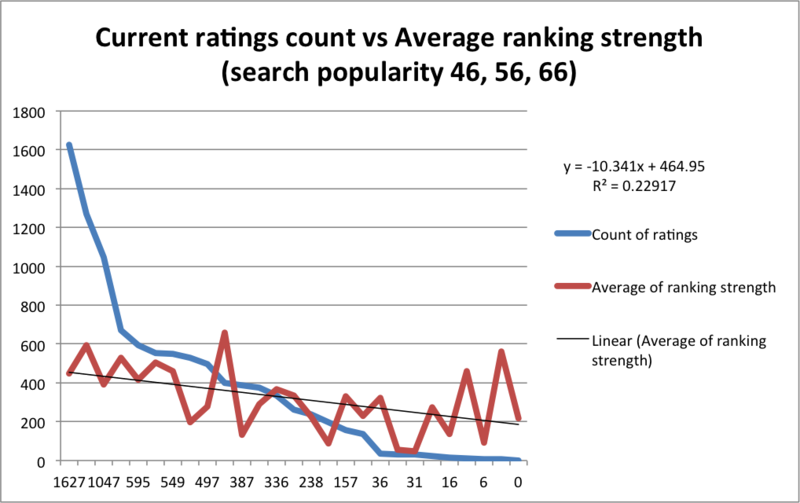 This was necessary to account for the difficulty in ranking for keywords with higher search popularity, and enabled an app that earned a rank of 10 for a keyword with a search popularity of 56 to earn a better ranking strength score than an app that earned a rank of 1 for a keyword with a search popularity of 5. 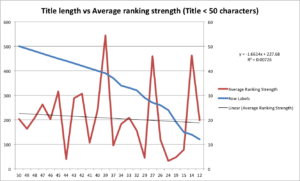 Because ranking strength uses the reverse of an app's rank, a high ranking strength number is better. 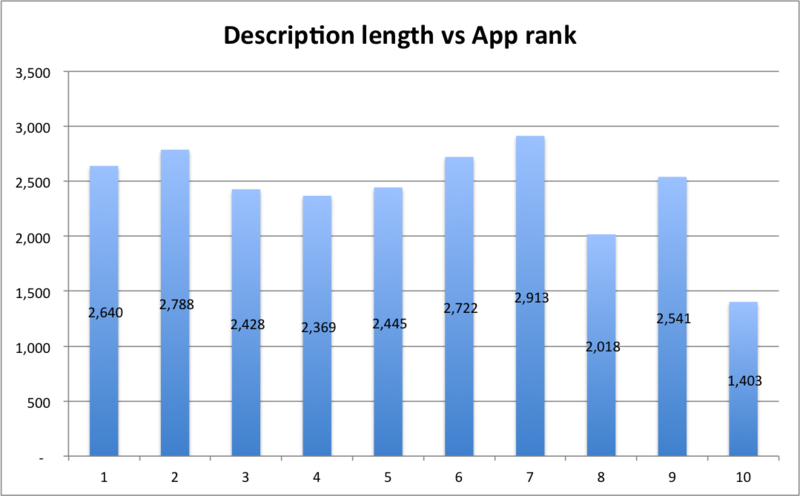 Description length: For the most part, the longer the app's description, the higher the ranking strength of the app. 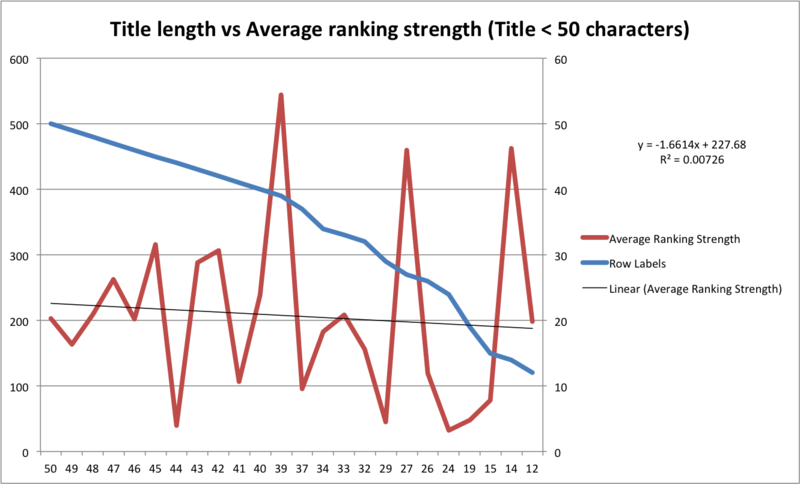 The top graph here shows ranking strength and the bottom graph shows an average description length by rank (not controlled for search popularity), for a comparison of the two data points. 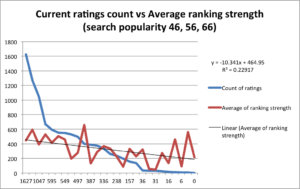 When filtered only for apps returning for keywords with search popularity 46, 56 and 66, this trend of longer descriptions correlating with higher ranking strength held steady. Type of description first five lines/opening (social proof vs. features vs. branding vs. keywords): Whereas the top 100 apps saw worse ranking for apps with social proof in their opening 5 description lines, for keyword rankings, social proof took the win, besting features with a +13% higher average ranking strength, followed by listing some of the app's features (which bested using keywords by +19%). When filtering for keywords with search popularity 46, 56 and 66, social proof retained the strong lead (ranking strength of 400), while branding (ranking strength of 304) edged out features (ranking strength of 298). for 2nd place. Was the keyword included in the description opening? 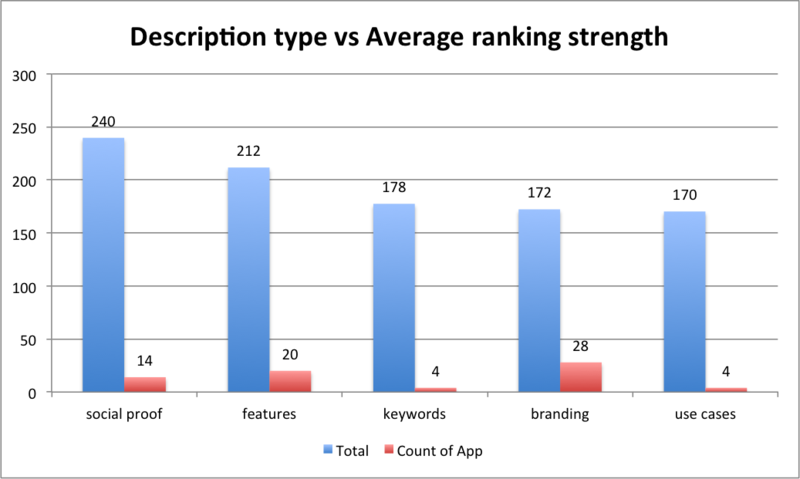 The ranking strength of apps that did mention the keyword in their first 5 lines saw a +91% ranking strength vs apps that did not; though as with some other findings, this was somewhat due to a concentration of this dimension in keywords high in search popularity. 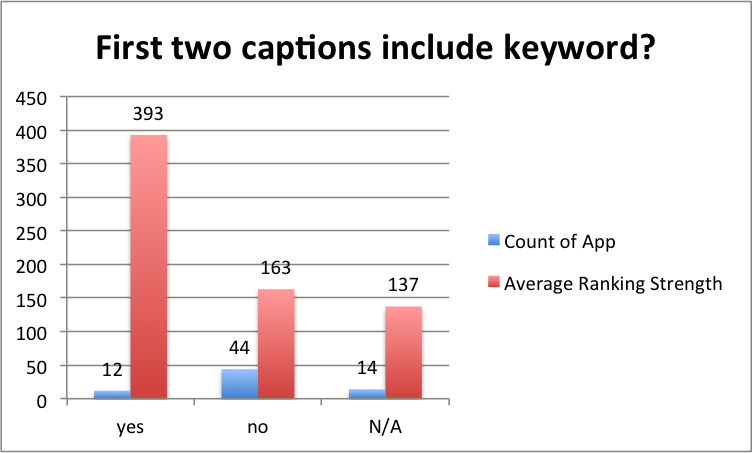 When filtering for only keywords with search popularity of 46, 56 and 66, the advantage evaporated and apps that did not mention the keyword fared better than those that did (301 for apps that did mention the keyword vs 344 for apps that did not bother). Price of the app: Surprisingly, the ranking strength of the six paid apps was +14% (222 vs 194) vs. free apps. When filtering for only keywords with search popularity of 46, 56 and 66, the advantage was retained and paid apps (371) outranked free apps by a larger margin (301). Was the app featured by Apple? The ranking strength of the five featured apps was no greater than those that were not featured (197 for un-featured vs 198 for featured apps). When filtering for SP 46, 56 and 66, featured apps (264) had a worse average ranking strength than non-featured apps (311). All-time number of ratings: There was hardly a correlation between more all-time ratings and a higher ranking strength (R-squared = .04273). When filtering for SP = 46, 56 and 66, the trend worsened, producing an R-squared value of .03284. 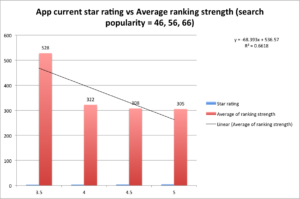 Yet, when looking at the current rating for apps returning for keywords with SP = 46-66, the R-squared value improved to .22917, indicating that, while both all-time ratings and current ratings are not incredibly important for ranking well, current ratings are 6.9x more important than all-time ratings for ranking strength (using a crude % difference between the R-squared values). 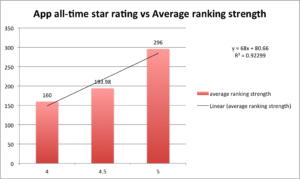 All-time star rating: Excluding three outliers (one 1-star app, one 3-star app and one 3.5-star app), it was clear that higher rated apps ranked better. That said: when filtering for SP = 46, 56 and 66, this advantage actually reversed, and apps rated 4.0 had the best ranking strength. 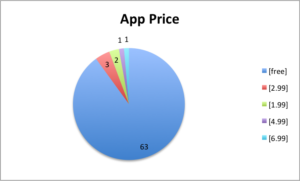 Looking at current ratings for apps with SP = 46, 56 and 66, the trend of higher rated apps ranking worse was more pronounced (though only one app had a 3.5 and a 4.0 rating each). 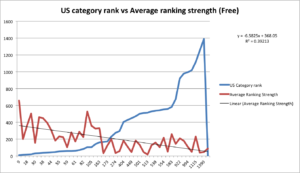 US category rank: In order to determine whether the category rank made an impact on an app's ranking strength, we first filtered the apps by paid or free pricing. 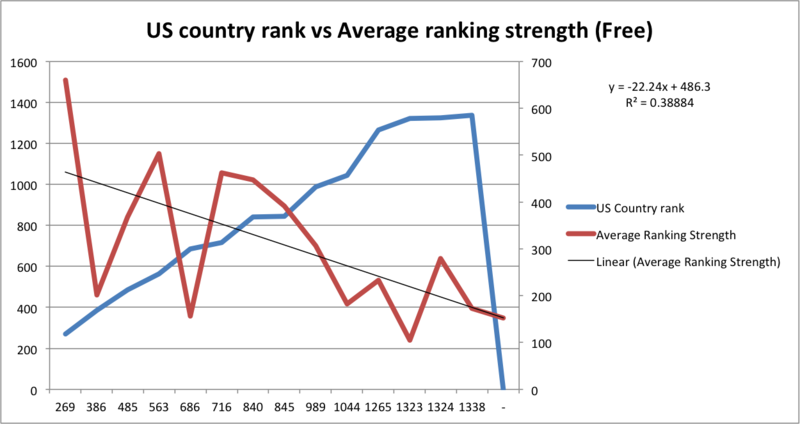 Next, we sorted ascending by the independent variable (US category ranking) and put a trendline on the dependent variable (ranking strength), to see whether an increasing category ranking value was correlated with a declining ranking strength. The graph tapers to 0 because several apps were not ranked. For paid apps, there was a decent correlation between having a better category rank and a higher keyword rank (R-squared = .36267). For free apps, there was an even stronger correlation between having a better category rank and a higher keyword rank (R-squared = .39213). The trend remained when filtering for SP = 46, 56 and 66 at a similar R-squared confidence. 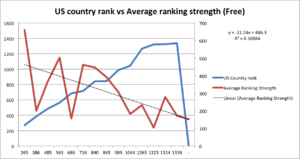 US country rank: Interestingly enough, the country-ranking influence on ranking strength was not stronger than that of category rank. For paid apps, the correlation was weaker (R=squared = .14534). For free apps, the correlation was present but weaker (R=squared = .38884). The trend remained when filtering for SP = 46, 56 and 66, though at about half the R-squared confidence. Was the keyword found as an exact match in the title? (Note: we allowed the word "apps" as a freebie match, and allowed plurals to be counted. 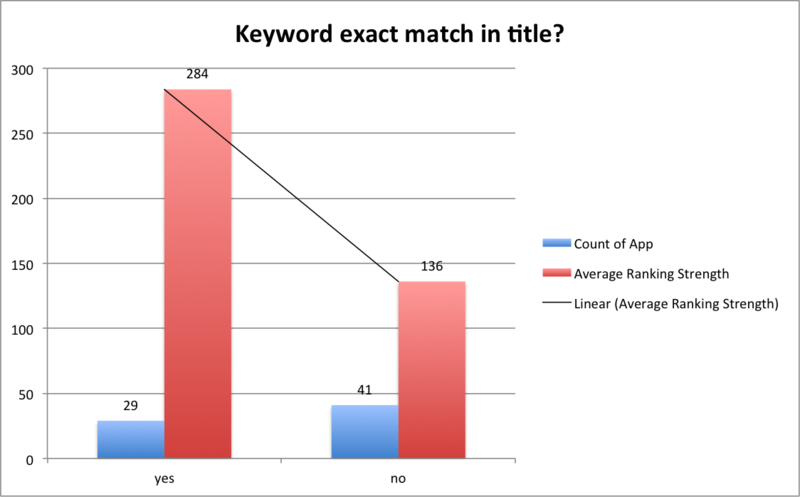 ): Apps which included the keyword as an exact match in the title bested those that did not use an exact match with a +109% average improvement. While the advantage was strong for lower search popularity apps too, most apps that used an exact match did so for higher search popularity keywords. 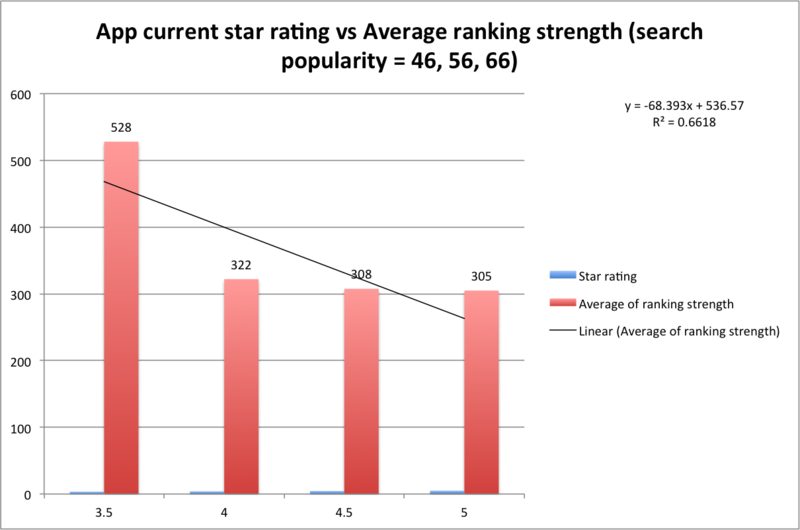 Filtering for SP = 46, 56 and 66, the advantage of using an exact match shrank, and the 24 apps which used an exact title match for a keyword did only marginally better than the 6 that did not (ranking strength of 309 and 304, respectively). 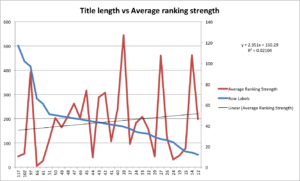 Title length: Several apps had not been updated since the 50 character title rule came into play, and these apps had a worse ranking strength. When ignoring these older apps, the correlation showed a slight favoring of long-titled apps. 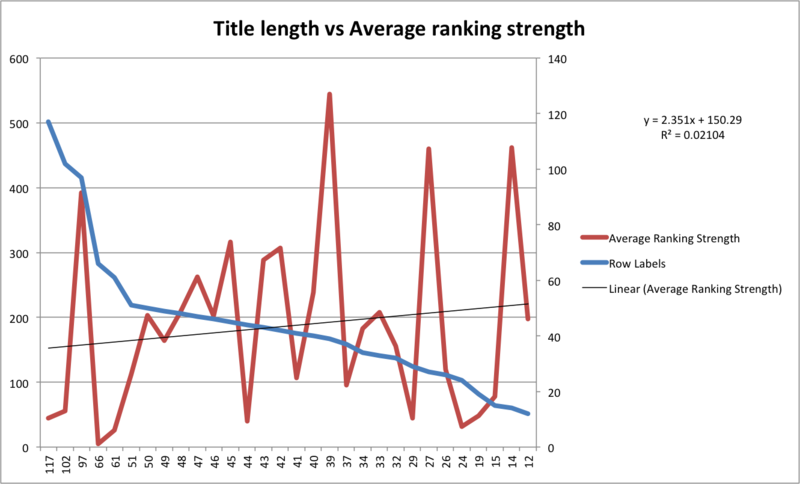 There was no correlation with a better or worse ranking strength for apps with long or short titles, ranking on keywords with SP of 46, 56 or 66. How many apps were in the developer account? 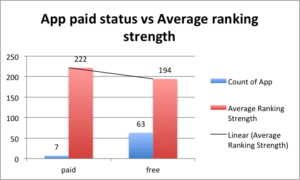 For this one we used a polynomial trendline to illustrate the fact that developers with more apps in their developer accounts were able to earn better rank, but only up to a point (the sweet spot was between 8 and 27 apps in the developer account). This is likely because more apps can produce economies of experience in acquiring top ranks (plus the benefit of capturing lots of keyword real estate), yet too many apps means that less effort is invested into making each app a quality listing, and thus rank falls when a developer churns out an exorbitant number of apps. When filtering for SP of 46, 56 or 66, the R-squared value favoring a middle band of apps in the developer account improved slightly, to .21395 (favoring about the same sweet spot number of apps). Was the icon related to the keyword? Apps with icons related to the keyword edged out those with no relevance to the searched keyword, with a 7% improvement. 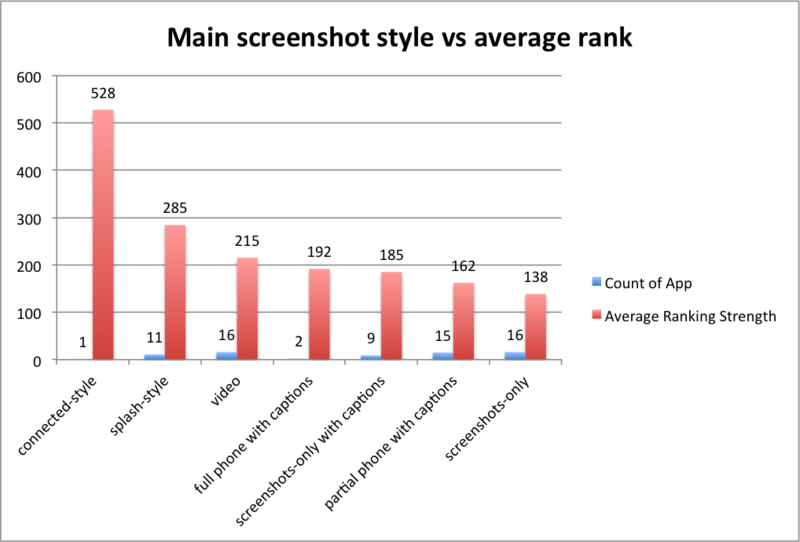 First two screenshots style main style: The one connected-style app captured the best rank, but was closely followed by apps which used splash-style screenshots (besting video-style apps by 33%) and next by apps with videos (besting full-phone caption apps by 12%). 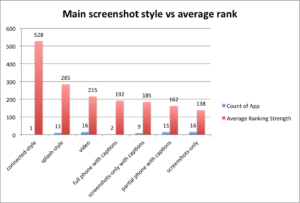 When filtering for SP of 46, 56 or 66, the connected style took the outlier first, but splash still maintained the lead (453), followed by video (365), with partial phone screenshots besting full phone screenshots for a distant fourth (299). Did the first two screenshot captions include the keyword? Apps that mentioned a recognizable variation of the keyword in their caption (i.e. "run would count for "running") had a higher ranking strength than apps which did not, earning a 241% improvement. When filtering for SP = 46, 56 and 66, the advantage remained (420 for apps that mentioned the keyword vs 268 for apps that made no mention). Several of these developers parlayed their larger portfolios into a bundle, capturing more keyword ranking real estate. For "running," the number one app (by Grinasys Corp) capitalized RUNNING in its title. Runkeeper earned a top 10 spot for both running and walking, without mentioning the word "walk" or "walking" as an exact match in its title. We counted over 100 apps for two developer accounts: "Shane Clifford" and "BlueToad, Inc."
"Workout challenge" apps used the phrase "fitness challenge," despite "workout challenge" having a higher search popularity score. Some biking apps used "cycling" instead of "biking," which was sensible, given cycling has a higher search popularity than biking. A few smaller apps were able to capture top 10 ranks by using exact match keywords in their title while other apps didn't (Fitness Planner and Gym Life). Fitness Planner was unranked and had an all-time rating of 1, but still earned a top 10 spot this way, usurping an app with a 4 star from over 3,000 ratings and a category rank of 560. Workout challenge apps were flooded with apps from developers that had many apps in the same focus. For keywords with search popularity under 40 keywords were not mentioned in the screenshot captions often and rarely as exact matches in the titles, likely due to space being conserved for higher search popularity keywords. General relevance deteriorated below search popularity 30, with apps less overtly relevant to the keyword surveyed earning top 10 spots with ease.